My name is John Durn, 50 years ago, I moved to Wotton from Kingswood, where I was born in Charfield Road. My late father William (Bill) Durn, was for 25 years, Clerk to the then Parish Council and Burial Board, and member of St Mary's Church Choir for over 30 years. I was absolutely thrilled, to come across your web site, and Dad would have been so thrilled, had he lived to see such information at the touch of a key. My wife Ann, and I were married in the then Rowland Hill's Congregational Church, by Mary Evans, in 1963 it was considered quite a novelty, to be married by a Woman Priest. I used to work at the old Cotswold Collotpye Co, as a colour retoucher from 1960 until 1973 when I left for Southampton. Vic Jellings was my line manager, and I have a host of memories and pics from those days. I have had a life long interest in Photography, my mentor being Donald Emes and Peter Neal, both former emplyees of CCC. 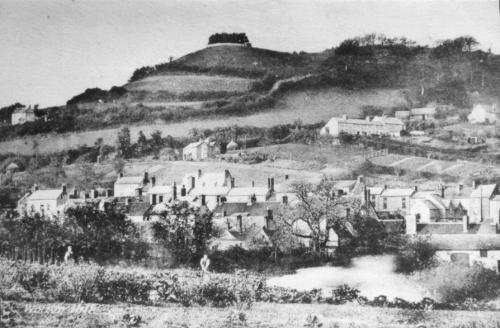 As I thumbed your lovely photos of the surrounding countryside and town itself, I was reminded very much of my childhood and early working life, in and around the beautiful town of Wotton under Edge. I went to school at the old Bear Street School from 1950 until 1954, head master Herbert Leach, then on to KLBGS from 1954 until 1959, before their new premises in Kingswood Road. I well remember the night one March, when the old Church Mill roof blew off, now I think the premiss form part of the Library area. in Ludgate Hill, we lived at the time above the old Luce Paynes Estate Agents at 16 Church Street. One of my memories is the 1950's eclipse of the sun, when we went into the playground to view the spectacle through smoked glass, and the day King George the 6th passed away in Feb 1951. I was in Doug Scaddings class at Bear Street School, when Srgt. Savidge came to break the news. The other officer at this time, was Pc Parry. I went to school with his children, Gail was one. On the coronation of our Queen Elizabeth, on 2nd June 1953, What a day, TV in Wotton cinema, tea in the Chipping, torchlight procession to Wotton Hill at night, we all had flaming torches lit in the fire station, which was at the time in the Chipping. Seems like yesterday. I just wanted to communicate briefly with the Town of my youth, and to pass on Christmas greetings to any one who may still remember Ann and me. Good luck with all your community projects, and I for one, as a railway buff, hope that Charfield Station opens very soon. I spent many a happy hour there in the 1950's, train spotting in steam days. Send us an email (address below) if you would like to communicate with John. We will send you his email address. The Gazette ran a condensed version of this article on January 11th. Thanks to Editor David Cullimore.